Hit the ground running in the 2018 Honda Ridgeline. With its impressive performance, the temptation to hit the road has never been more powerful. So start planning your next adventure, because the Ridgeline is raring to go. Whether you’re traveling up a mountain road or heading down a dirt path, the powerful 3.5-liter, i-VTEC® V-6 engine with direct injection and 6-speed automatic transmission delivers the per formance you need for the journey. Producing 280 hp and 262 lb-ft of torque, the Ridgeline still received a remarkable 25-mpg highway rating. Come to Ralph Honda to see why the new 2018 Ridgeline is a great fit for you! Simply submit the form on this page or call 585-978-3070 for your personal Fit test drive experience. 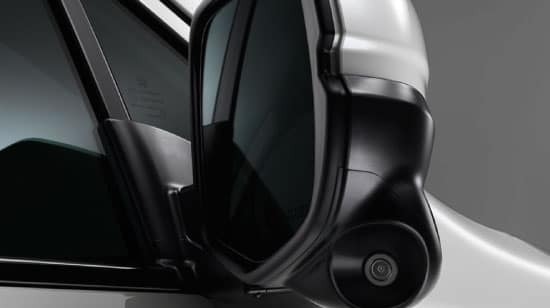 From an available Blind Spot Information System to a standard Rearview Camera, Ridgeline is packed with cutting edge, confidence-boosting technologies. The available i-VTM4™ AWD System works with Intelligent Traction Management, which includes four unique modes for normal conditions, snow, sand and mud. An impressive 4.2” color Multi-Information Display and a steering wheel with controls make it easy to answer the phone, change the song or turn up the volume. 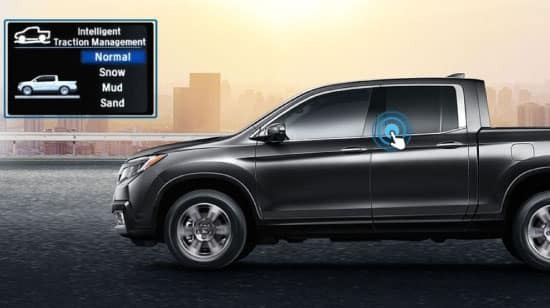 Just signal right and a small camera displays live video on your Display Audio screen to reveal nearly four times more than the passenger-side mirror alone. 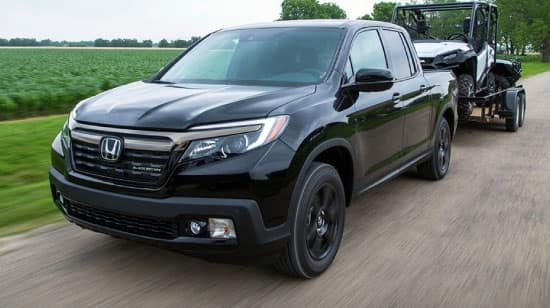 With 280 hp, 4-wheel independent suspension, an available intelligent AWD system and unit-body construction, Ridgeline is always raring to go. 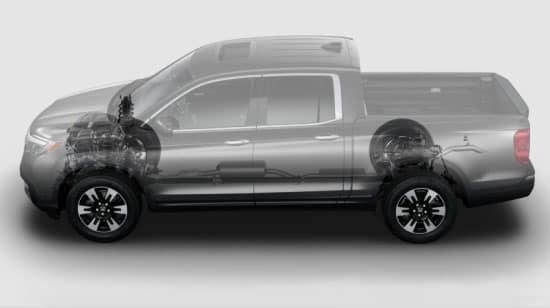 Ridgeline AWD models feature a standard integrated tow hitch with 7-pin connector, 262 lb-ft of torque and the ability to tow up to 5,000 lbs. 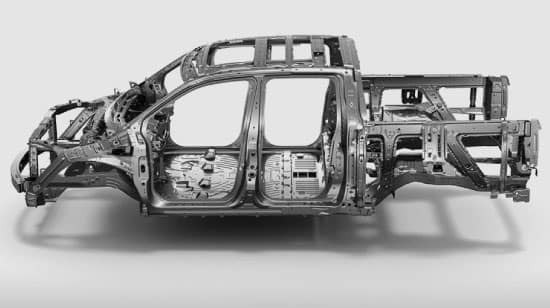 With unit-body construction, the body panels and chassis are a single molded unit, providing a rigid yet lighter structure, helping 2WD models receive a 26 mpg highway EPA rating. From off-road toys to 4’ x 8’ sheets of plywood, the bed of the Ridgeline was designed with minimal wheel well housings in order to maximize hauling capabilities. An available 150W/400W Truck-Bed Outlet in the wall of the bed allows you to plug power tools or a TV right into the truck. The lockable, 7.3 cu. ft. In-Bed Trunk® includes a drain plug, so you can use it as an ice chest or a place to store wet gear without compromising bed utility. Listen to your favorite music outside with an available, industry-first Truck Bed Audio System, which uses the bed walls to pump out great sound. THE 2018 RIDGELINE IS HERE! 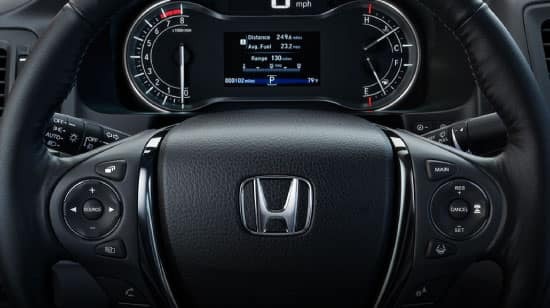 For more information about the latest Honda technologies and features available in the new Ridgeline, simply give us a call at (585) 978-3070 to setup a Test Drive, so you can experience everything first hand. MSRP excluding tax, license, registration, $940.00 destination charge and options. Dealers set own prices. 19 city/26 highway/22 combined mpg rating for 2WD models. 18 city/25 highway/21 combined mpg rating for AWD models. Use for comparison purposes only. Based on 2018 EPA mileage ratings. Your mileage will vary depending on how you drive and maintain your vehicle, driving conditions and other factors. 5,000 lbs. maximum towing capacity for AWD models; 3,500 lbs. for 2WD models. Towing requires accessory towing equipment. Please see your dealer for details. 262 lb-ft @ 4700 rpm.